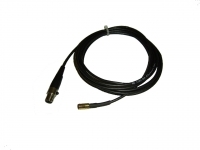 The ¼“ iSEMic Microphone and Accessories Series is supply and signal voltage compatibility to iPhone*1, iPad*1 as well as other mobile devices including laptop computers and Phantom Powered Pro Audio Equipment. The superb functionality is provided by the space saving microphone built-in electronics. The advantages of the new iSEMic microphone series are obvious. Mobile devices like iPad’s and iPhone’s are more and more used for controlling live sound mixers and PA Systems giving the FOH and system engineers the possibility of walking the venue while optimizing for sound and acoustics using special apps on mobile devices. Back at the FOH place the same microphone can be used to service the PC or MAC computer by the use of an off-the-shelf USB interface and XLR cable. With its mechanically robust design it is well suited for harsh environment use such as open air sound reinforcement measurements. Its class 2 frequency response makes it predestined for room acoustics analysis including recording studios and home theaters. It can normally be used without the included freefield calibration data file for compensation. In this case take the individual calibration data as proof of its superb performance. · Powers from: iPhone, iPad, other mobile devices, laptop computers, Phantom Power, ICP/IEPE power. · Sensitivity optimized for mobile devices (e.g. iPad) not to clip. · Temperature compensated for accurate SPL monitoring. · Calibration chart and freefield– & diffusefield calibration data files download ready. *1 The corporate names and names of the products stated in this brochure are trademarks or registered trademarks of the respective companies. Customer reviews for "iSEMic 760TR Measurement & recording microphone Line6 Kit"